Proximity transducers use Eddy Current principle to measure the distance between the probe Tip and the surface to be observed. The proximeter generate a low power radio frequency (RF) signal. This RF signal is connected to a coil of wire inside the probe tip by the extension cable. When No conductive material is within the range of RF signal which surrounds the probe tip, virtually all of the power released to the surrounding area is returned to the probe. When a conductive surface approaches the probe tip, the RF signal sets up small eddy currents on the surface. These eddy currents creates a measurable power loss in the RF signal. When vibration tip nearer the target the greater the power loss. The system uses this power loss to generate as output voltage. The output voltage of the proximeter is linearly proportional to gap over a wide range. 1) Physically check the vibration probe and extension cable for any damages, if it is please Replace with new one. 3) Place the vibration probe on TK-3 spindle and adjust to the target plate surface and make sure the scale should be zero. 4) Connect multimeter on proximeter common and Vout terminals. Apply input voltage. 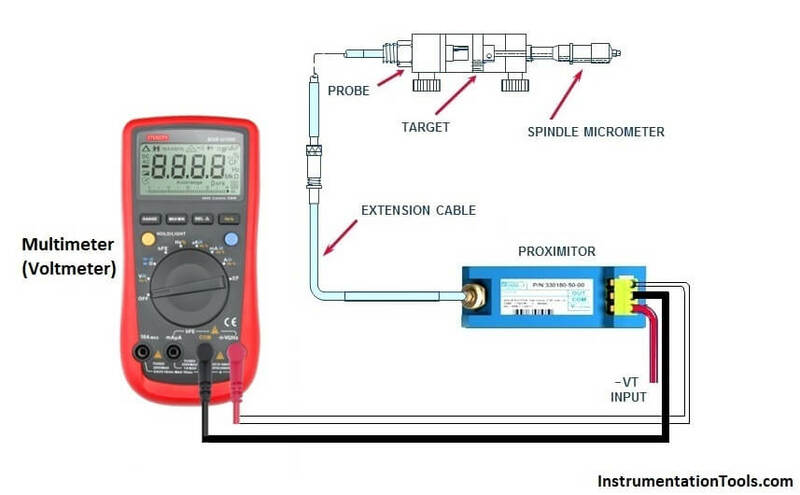 5) Measure the output voltage (multimeter reading) and increase the target distance in the TK-3 calibrator and follow the same steps as per given table and note down the output voltages at different displacements (gaps). 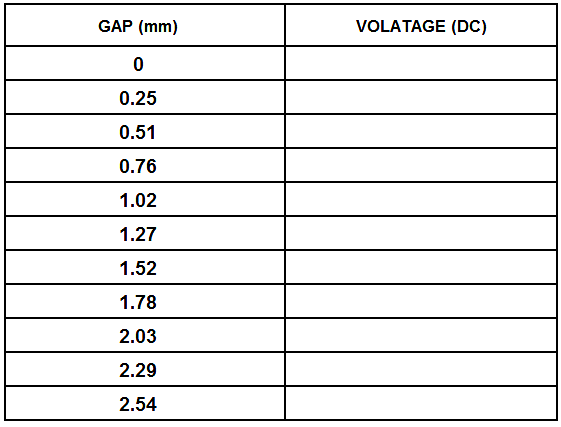 6) After this make a graph which shows the relation between gap and voltage. 7) If graph is linear in between 10 mils to 80 mils then probe is in good condition. Why we use Negative Voltage in Vibration Measurement ? What is TK-3 Calibrator ? 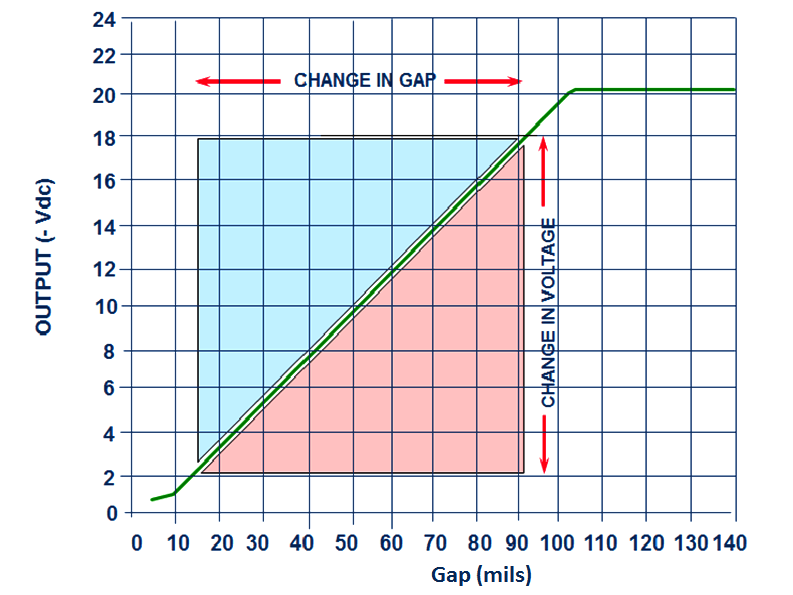 Thank you for the article, there is a mistake in the graph though : Gap is in mils not in millimeters. Corrected. Thanks for your efforts & updates. Incremental Scale Factor (ISF) is just as important as Average Scale Factor (ASF). For a better proximity transducer system verification, one can easily refer to Bently Manuals. They have written the procedure in a clear and concise manner. Another important thing, need to confirm machinery shaft material as well whether the proximitor used is modified for linearity other than AISI 4140 (typical material for shaft). You can see physically a ‘MOD’ sticker with details on it, on the side of the proximitor itself. Performing a verification check using a MOD proximitor against a standard AISI 4140 spindle micrometer will render the result invalid.